Enchant the visitors to your bird garden by adding the Heartwood Turquoise Birdiwampus Bird House to it. The offset body, extended roof, and bright color of this home add whimsy to your yard, and are sure to capture the attention of any visitor. A vivid blue, cypress body offers birds a fantastic roosting spot, and a 1.5" diameter entry hole allows bluebirds passage. Gray, painted vertical lines throughout the unit add an aged look and complement its height, while a horizontal seam near the base creates an offset appearance. The generous roof gently curves opposite of the home for even more shape and angles, and a copper cap and ridging here gleam in the sunlight. This tall design helps regulate the interior temperature of the abode, and protects the nest from rain. Drainage on the bottom directs water away from the nest, and the cypress body ensures a lasting piece. A wide, level base and included mounting bracket make it easy to place this home on a 4 x 4 post, and a cleanout disc on the back removes for seasonal maintenance. 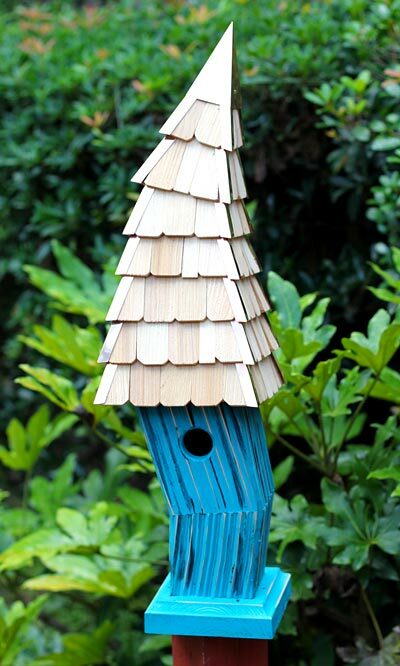 The bright blue finish offers a lively look to any setting, and placing a few of these homes together forms a magical village for your feathered friends. Turn your bird garden into a captivating retreat with this Turquoise Birdiwampus Bird House. Made in the USA.